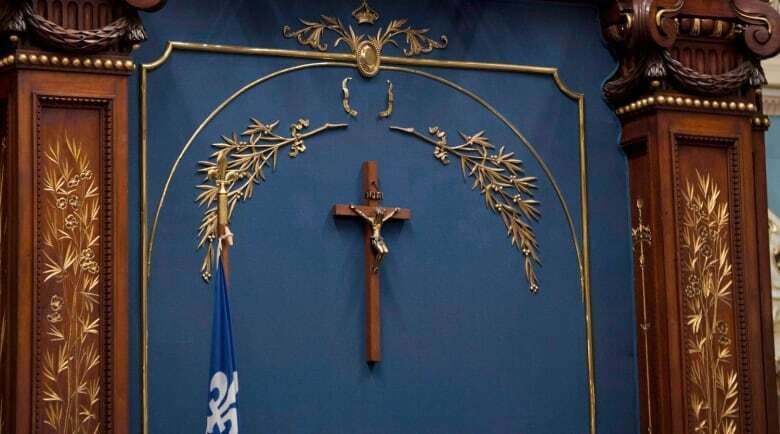 The crucifix hanging in Quebec's National Assembly is a historical symbol, not a religious one, even though it represents the Christian values of the province's two colonial ancestors, premier-designate François Legault said Thursday. Legault made the comments as he defended his decision to keep the crucifix in the legislature while moving forward with plans to ban certain civil servants from wearing religious symbols. 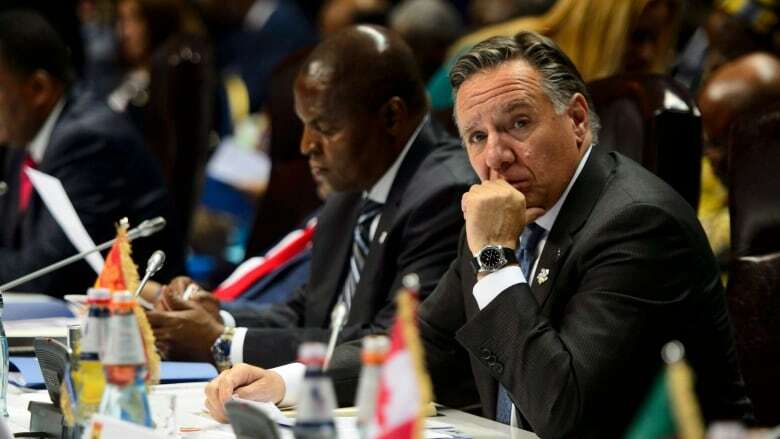 "We have to understand our past," Legault told reporters in Yerevan, Armenia, where he is attending the summit of the Francophonie. The crucifix, he said, invokes the role of French Catholics and British Protestants in Quebec's history. He made no mention of Indigenous people. "In our past we had Protestants and Catholics. They built the values we have in Quebec. We have to recognize that and not mix that with religious signs." The crucifix was installed above the speaker's chair in the National Assembly in 1936. A government-commissioned report into secularism and identity issues recommended in 2008 that it be removed, but no government has done so. Since his Coalition Avenir Québec won a majority in last week's provincial election, Legault has said one of his priorities will be preventing civil servants in "positions of authority" from wearing religious symbols, such as hijabs and kippas. Among those to be affected are police officers, provincial judges, prison guards and teachers. The move is necessary, according to Legault, in order to protect Quebec's secular society. He raised his plans in a meeting earlier Thursday with Prime Minister Justin Trudeau, who is also in Yerevan attending the Francophonie summit and who has publicly opposed Legault's proposal. "This is a ... delicate issue with Mr. Trudeau," Legault said in an interview with Radio-Canada. "I told him I want to do this quickly. It's an issue that has lingered for 10 years, and now there is a consensus in Quebec." Asked whether he feared a confrontation with Ottawa over the issue, Legault added: "Quebec is a nation. It is a distinct society. We have support. We just received a clear mandate in the election. I think all that has to be taken into account." Along with religious symbols, Legault also raised his immigration polices with Trudeau. The incoming premier informed the prime minister that Quebec intends to accept 20 per cent fewer immigrants next year. Legault also told Trudeau that Quebec will add language and value requirements for immigrants seeking to settle in the province. Though immigration falls under federal jurisdiction, Quebec has an agreement with Ottawa that allows it to select its own economic immigrants. According to Legault's account of the meeting, Trudeau raised the possibility that Quebec would be able to alter how it selects immigrants without reopening that agreement. 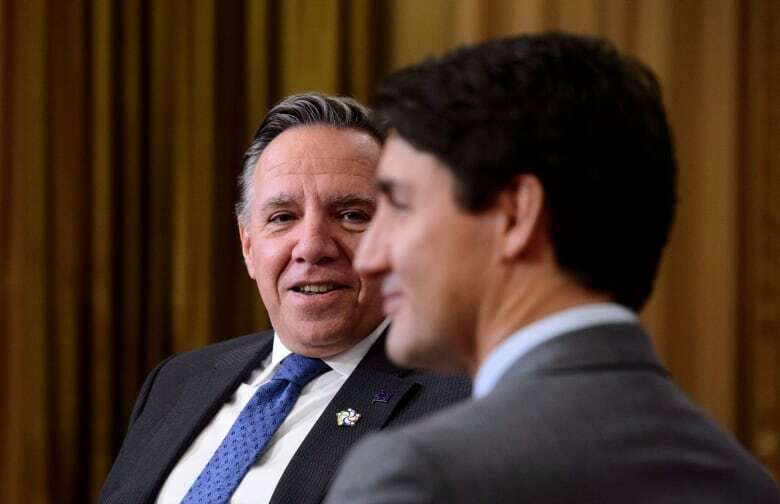 "He wasn't certain that we would need to modify the agreement between Quebec and Ottawa," Legault said in the Radio-Canada interview. He added that representatives from the province would meet federal officials in the coming weeks to detail the "new immigration model that my government will put in place." Legault is scheduled to appoint a cabinet next week.